De 2015 editie is compleet bijgewerkt met de laatste dieptemetingen. Nieuwe dieptecijfers voor Mevagissey Harbour, The Bar Salcombe, Falmouth Harbour en Plymouth Sound. De veranderingen in Falmouth Harbour zijn opgenomen. English coast from Salcombe to Lizard Point. Minute gridlines. Scale: 1 : 100.000. Larger scale plans of Falmouth, Polperro, Mevagissey, Charlestown, Fowey and Looe. Tidal stream diagrams. 2012 EDITION - Fully updated using the latest depth surveys and wreck data throughout. 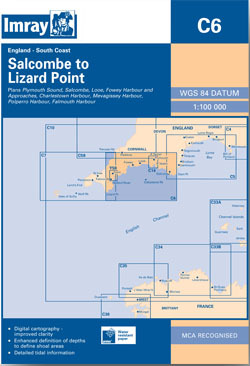 Revised depths are shown at Mevagissey Harbour, The Bar Salcombe, Falmouth Harbour and Plymouth Sound. The latest work developments are shown at Falmouth Harbour.